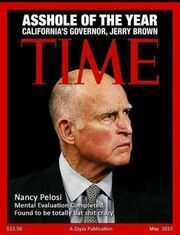 Governor Jerry Brown is actually hit or miss. He's a bit of an old school Democrat, that still has some sanity, and is not a hyper-progressive douchebag on some thing -- then he goes full retard on others. He refuse to sign a couple of unconstitutional gun laws that his cadre of illiterati sent up to him -- but he signed others. For a Democrat, he's somewhat fiscally responsible in balancing budgets and willing to cut some thing (and he tries to setup a rainy-day fund) -- but he often cuts the wrong things and throws money down a pit on things like stem cell research, cap and trade/Carbon credits, or his Crazy Train, and other really bad projects. So California could do worse, like Gavin "I fucked my best friends wife" Newsom. And I almost respect his fiscal responsibility, if there weren't so many other things to really dislike his policies for. He's not really a moderate, he's more like a dementia patient, with bouts of lucid clarity, and the next moment he's wearing a tinfoil hat and telling you how that stops the CIA from reading your mind.